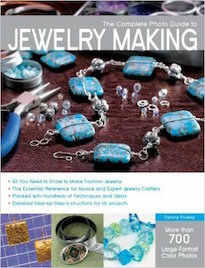 I was recently asked to create a piece of pet-themed jewelry for one of Jewelry Making Daily's new FREE eBooks. I pounced on the opportunity! We are pet enthusiasts and share our lives with two cats: Paulo and Babette. We love them so much that we call them our "kids". 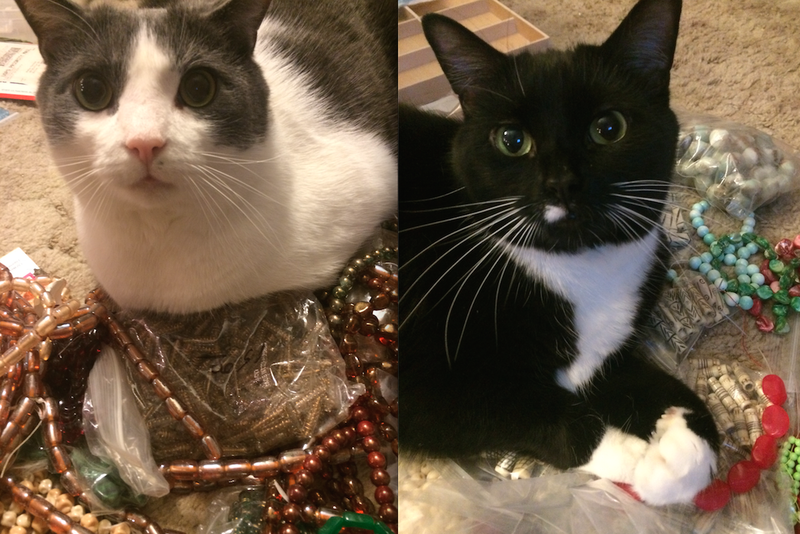 Above is a picture of Paulo and Babette hanging out with some beads. When I was thinking about what to make, all I needed to do was look around the house. It seems as though there was an explosion of beads and string! I decided to use the cat toys as my inspiration. Thusly, the Tangled Cat String Pendant idea was born! The focal is a slider that has a very Asian vibe to it. I used the Dandelion Metal Stamp from ImpressArt to texture the sheet metal and give it more visual interest. I love mixed metals and hung a fine pewter Lucky Cat charm made by my family at Green Girl Studios. 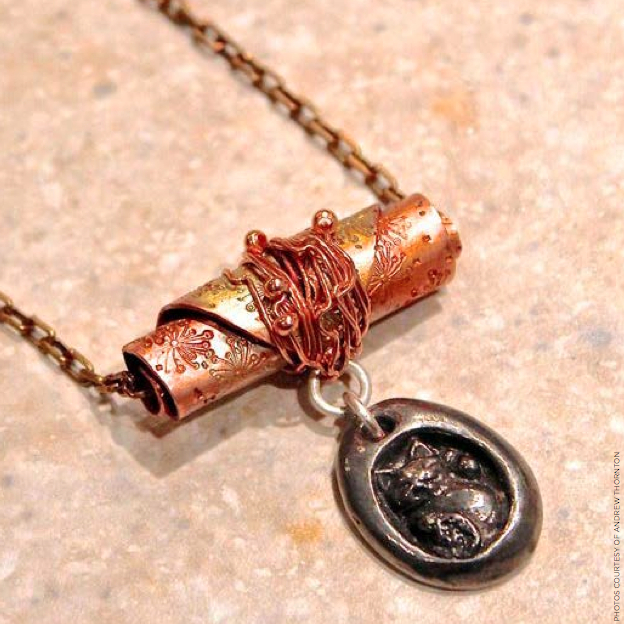 As Tammy mentioned in her post about the pet-themed projects, this focal has a lot of possibilities for variations, including using actual string or wool-covered wire like WoolyWire in place of the bare copper wire. You could also switch out the Dandelion Stamp for a Paw Print stamp or any of their Animal themed stamps or Stick Animal Stamps. You could even stamp the name of your pet. This is perfect project for customization. To get the full instructions on how to make the Tangled Cat String Pendant (plus instructions for two other pet-inspired projects), CLICK HERE. As we drove away, I snapped a picture. The day was spent packing up our last possessions and cleaning our former location. We swept, we mopped, we filled the nail-holes in the walls. We scrubbed, scoured and did our best to remove all traces that we had been there at all. I know that these were just walls. This was just another building in a row of many buildings, but for the past three years, this is where we called home. This is where we invited people in and encouraged them to get in touch with their creativity – a part of themselves that some thought was nonexistent. We worked hard and poured love into everything that we did. Through this storefront on a street that could be in any small town, we made friends, laughed until our bellies ached and raised a toast to many passages of life. From our window, we watched intrepid toddlers taking increasingly brave steps, processions for prom, weddings, and funerals, parades with streamers and pagent-winning pretties waving on floats. We have seen life unfold in an American town. I was sad to say goodbye. I couldn't help but think of all the remarkable people who walked through the door. Travelers from all over the world have stepped over the threshold. The space was a meeting place of people. And while there were many blessings in these rooms, there were rough patches, when it all seemed impossibly hard. Words were said in anger. Things went missing. Feelings were hurt. Friendships were lost. But what sticks with me isn't the bad. What truly resonates is all the good. I loved seeing the look of triumph on a person's face when they did something that they thought they couldn't do before. I loved hearing stories and learning about the people who frequented our business. I loved being a part of the community. And what I loved best was creating beauty and helping inspire others to create beauty as well. I don't think any farewell would be complete without saying a few words about our shopmate. 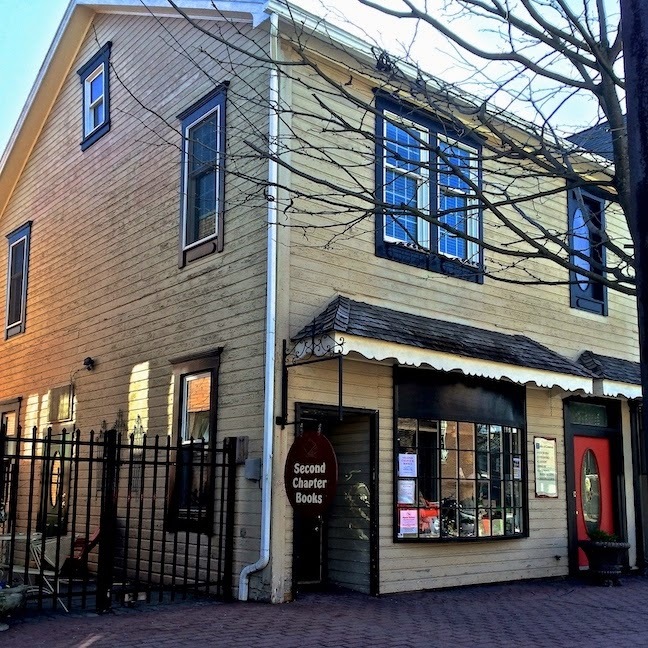 Laurie of Second Chapter Books gave us this amazing opportunity to share the space and allowed us to fulfill a dream that we didn't think possible. William and I both thought that someday, maybe, one day we would open a brick-and-mortar store, but it always seemed like an impossible dream. Laurie helped make that a reality. 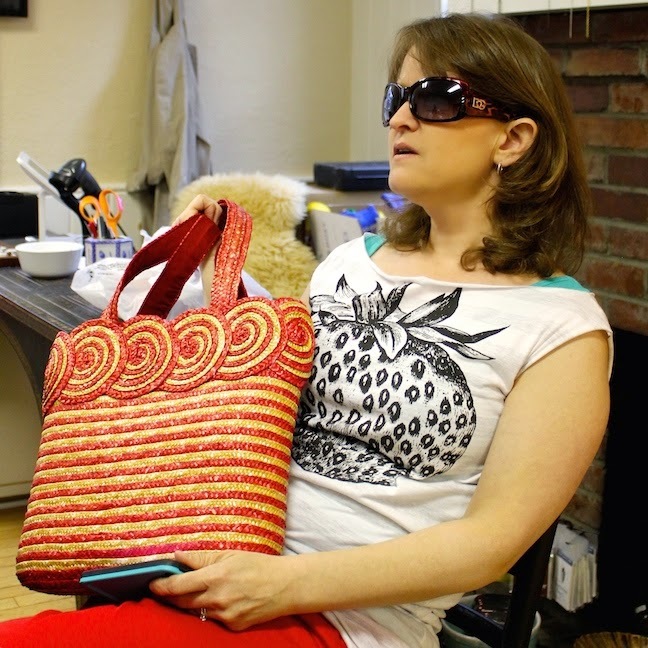 She opened her storefront up, invited us in, and has helped in so many ways. I cannot count how many hours we've spent together, sharing stories, making things, and believing in this town and the community. She has been patient, kind, and encouraging. We wish nothing but the best for her and all her future endeavors! As we drove away, I snapped a picture. I captured a photo of a place we used to call home, a nest we built little by little. And while it was sad to say farewell, there was also a bubbling feeling of excitement. Ahead of us lay unknown mysteries and new adventures. Even though the new store is only a few stores down – a block away – there seems to be a world of possibility opening up. We pulled in front of 215 East Main Street and I smiled. Good things are coming. Searching for symbols, looking for meaning. The clouds, the cards, tea leaves – all unyielding. There in the dustpan, tucked in the crumble of dirt and debris, an unexpected message: Wisdom. 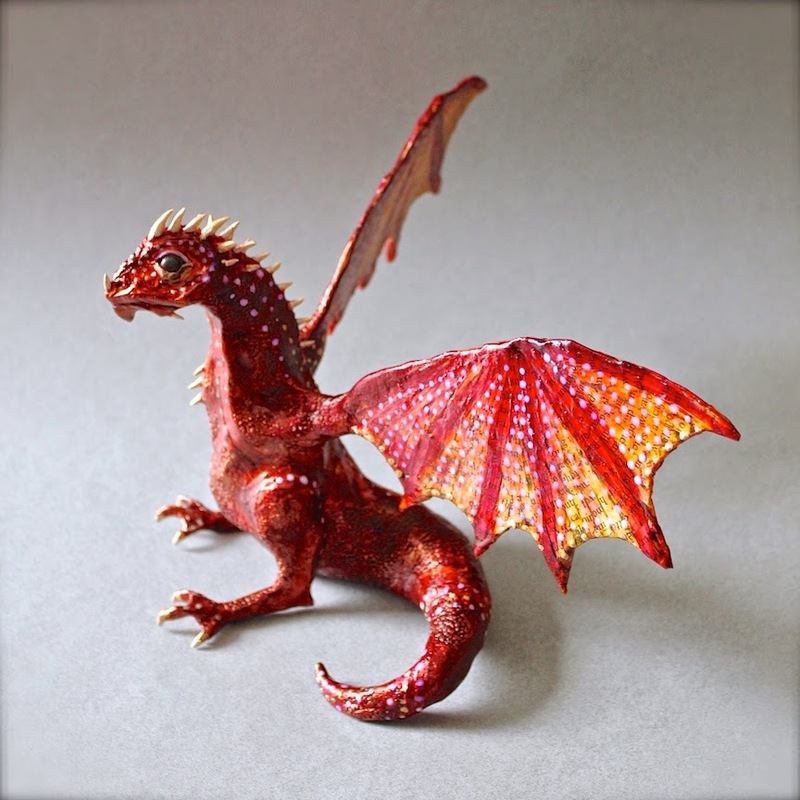 Originally, I was only going to make the mermaid sculpture for Novel Art, but then I started conversing with the Director of the Ligonier Valley Library and I remembered her talking about a fantasy series featuring dragons. Once the idea to make a dragon was in my head... it stuck! (It wasn't hard. I'm a fan of dragons as you can tell from HERE and HERE.) I couldn't sleep that night and decided to get busy since there wasn't much time before the deadline. My pile of work seems incredibly high at the moment (with the move and everything in the process), but I just couldn't help but make this sculpture. I should preface this by saying that it's not finished. The base is still drying and I need to stain and seal it before I can mount the dragon sculpture to it. Like the mermaid sculpture, the concept is how reading brings fantasy to life. I've integrated old book pages in patterns swirling over the body of the dragon and in the wings. I constructed the body out of polymer clay over an armature of aluminum foil and steel wire. I then painted, painted, painted, covered it in resin, stained it, highlighted the piece with Gilder's Paste, and painted it some more. I had this idea that I wanted the coloring to be light and almost watercolor-esque to incorporate the text pattern more, but the more I kept touching it up, the muddier the colors got and the more paint I added. Here's a close-up of the head and crown of horns. For the eyes, I used dark blue, Swarovski crystal pearls. I think it gives the eyes great depth. Here's a detail of one of the wings. The wings are actually hollow. I constructed everything out of wire, covered both sides with book pages, dipped them in resin, and then glued on shredded book pages in an almost feather-like pattern on the wings. I then coated them again with lots of spray fixatives and sealants. Once everything was dry, I stained the wings and added some paint to bring out the structure of the wings. I also added some iridescent spots. I tried to keep the paint and inks as light as possible, so that the suggestion of words came through. I feel like on the body, some of the word details were lost with so much paint. I'm really happy with the result, especially since it was a last minute decision. I hope that it raises a lot of money for the library! 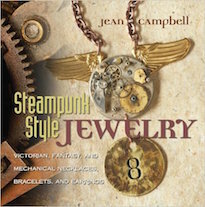 Novel Art is such a worthwhile cause and I am so honored to be a participant! 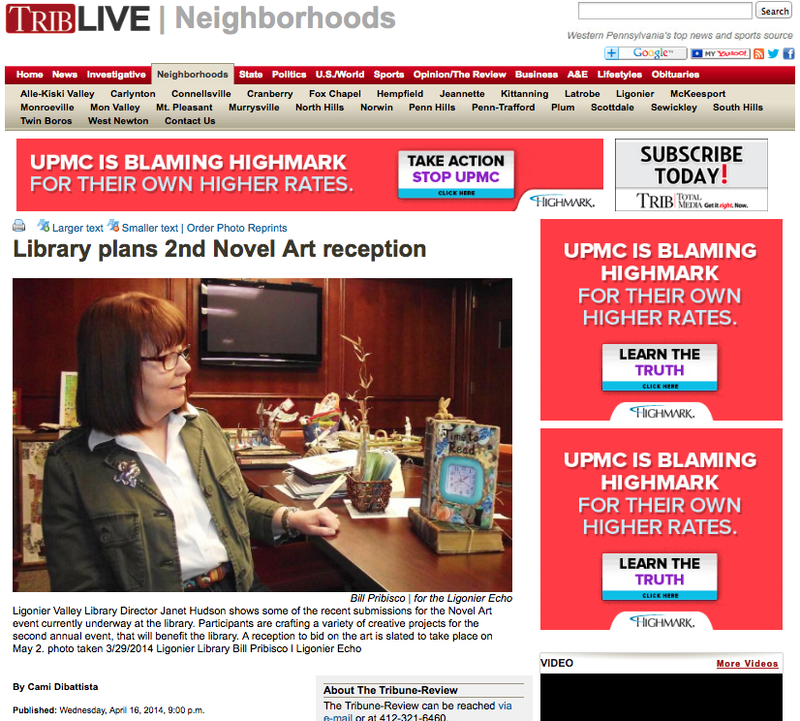 Our local library has a really cool fundraising project called, Novel Art. The concept is that they part with old books no longer in circulation and give the decommissioned books to participants with the task of turning the books into pieces that can then be auctioned off. The money goes towards expensive upgrades that would otherwise go unfunded, like technology. To find out more about the project, check out the article that appeared in the Ligonier Echo by CLICKING HERE. 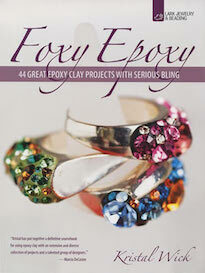 In the article, I'm quoted as one of the professional craftspeople who will be participating. I mentioned a mermaid sculpture. This is that piece. The concept behind this piece is that "reading brings fantasy to life". So, the mermaid is transforming from the written word into a realized creature. 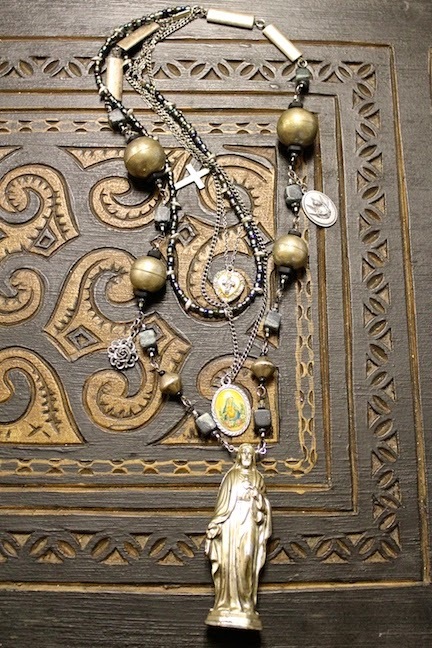 This is a close-up of her face (and her jewelry that I made for her). 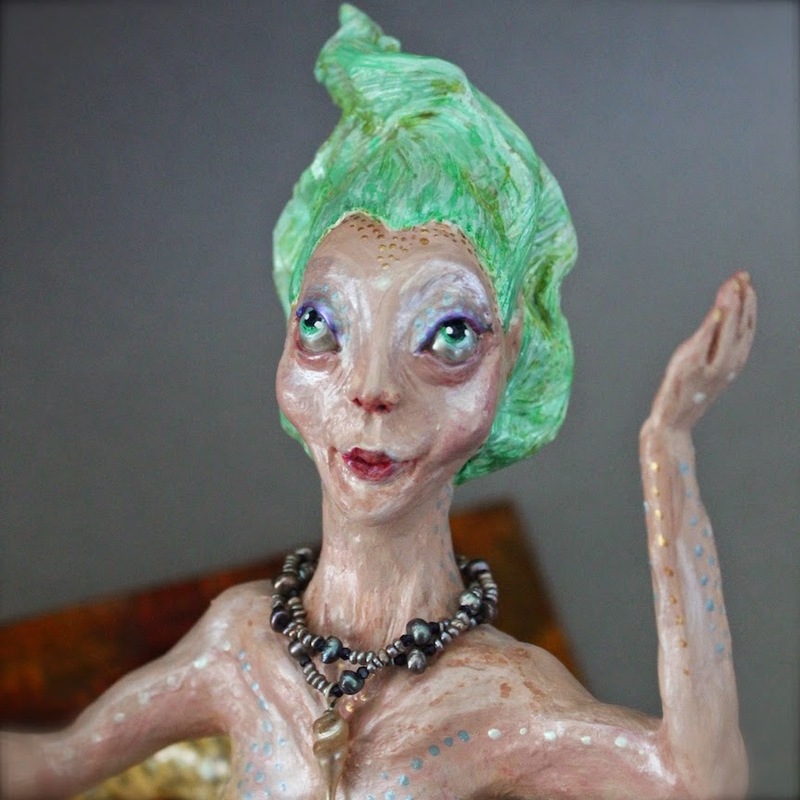 I created the piece out of polymer clay over an aluminum and steel armature. I then did layers of paints and inks. Here's the backside of the piece. 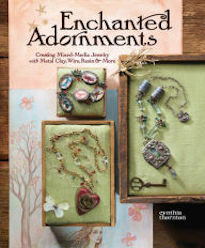 I created the base from an old shadowbox that I flipped over and decoupaged torn up pieces of old book pages. I then did some coats of resin and stained everything with colored inks. I'm pretty pleased with the way that the sculpture turned out. I hope it raises the library a lot of money! 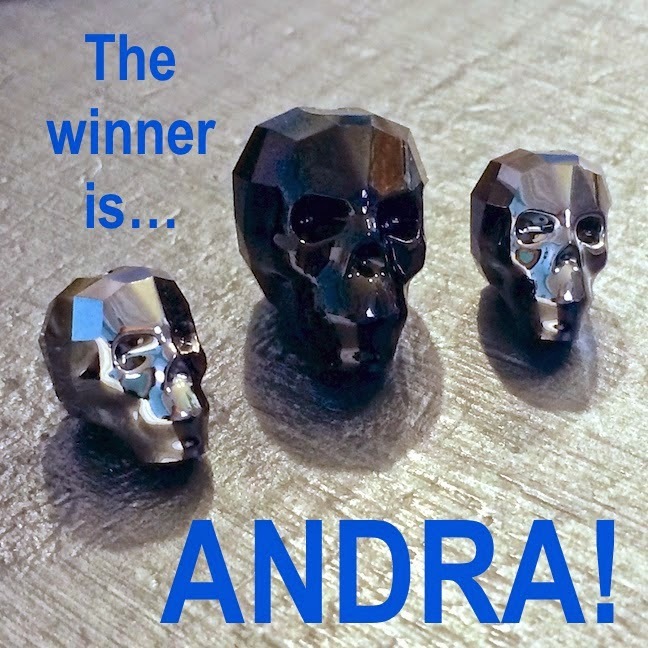 Let's put our hands together and congratulate Andra on being the winner of the most recent Thursday Giveaway! Congratulations, Andra! She won a selection of Swarovski Crystal Skull Beads courtesy of Fusion Beads! A big thanks goes out to everyone who participated! Keep your eyes peeled for another great Thursday Giveaway! On the 26th Day of the Fusion Beads 30 Day Bead Challenge, we were asked to create a wire-wrapped ring. For the ring, I used wire for the ring shank and attached a vintage button. I then used two-part epoxy clay and embedded some vintage rhinestones. I'm a smitten kitten with the vintage marquise-cut crystals. They're two-toned and sparkle like crazy. The configuration of the crystals sort of reminds me of a Pennsylvania Dutch hex symbol. The ring is certainly fun and has a lot of BLING! Here's another piece that I created for the Fusion Beads 30 Day Bead Challenge that I never posted. This one was created for the Day 25 prompt to use a bead that's been in my bead stash forever. 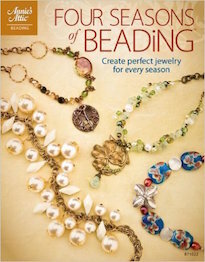 With this particular challenge, my biggest problem was selecting which particular bead to dig out. I have a lot of really cool beads and I was on the fence about which one I wanted to use. The past few weeks, I haven't had much time to spare, so I had to be super selective about which to finally settle on. I opened a box that I have had since the Bead&Button show a few years ago and right in the middle of it was a polymer clay Forsythia Pendant by Heather Powers of HumbleBeads. And I knew – I just knew – that I had to make something with this particular piece. And so I did! 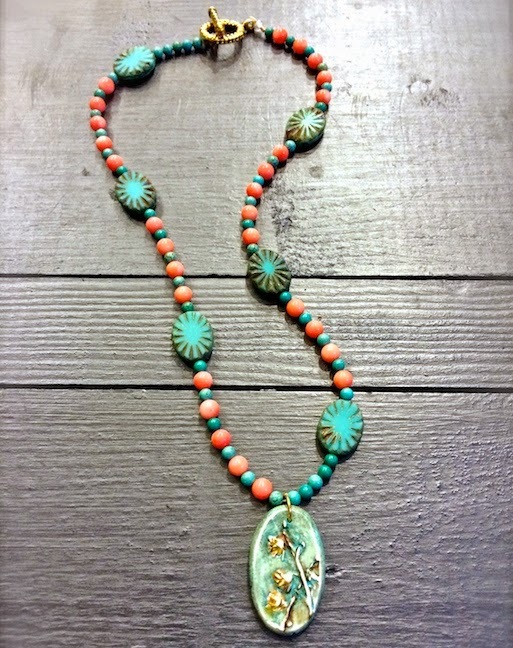 I paired the polymer clay pendant with some pink coral rounds, turquoise-dyed magnesite rounds, carved Czech glass ovals, and a bronze toggle to create this asymmetrical piece. I love how bright and fun the colors are. I think they accent the focal nicely and carry the blue-green around the piece. The bright gold of the bronze toggle picks up the flowers in the pendant. 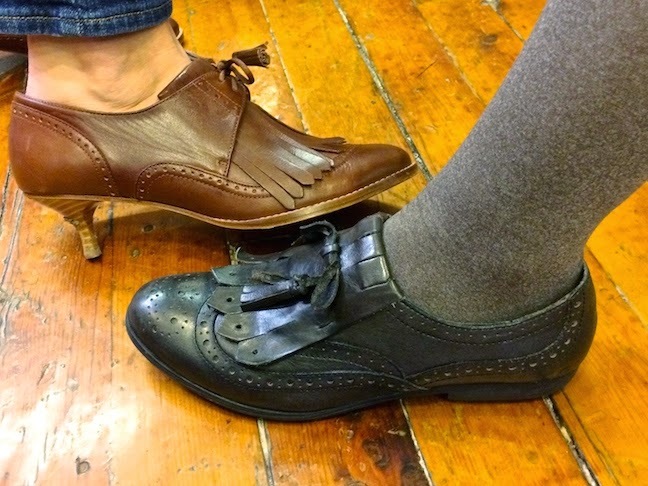 It's a great piece for spring! Here's another piece that I created for the Fusion Beads 30 Day Bead Challenge. The prompt for Day 24 of the celebration of National Craft Month was to learn a new technique. For this challenge, I asked William to show me how to kumihimo. I've been watching William and his mom do it for awhile, so I picked it up pretty quick. It's super fun! 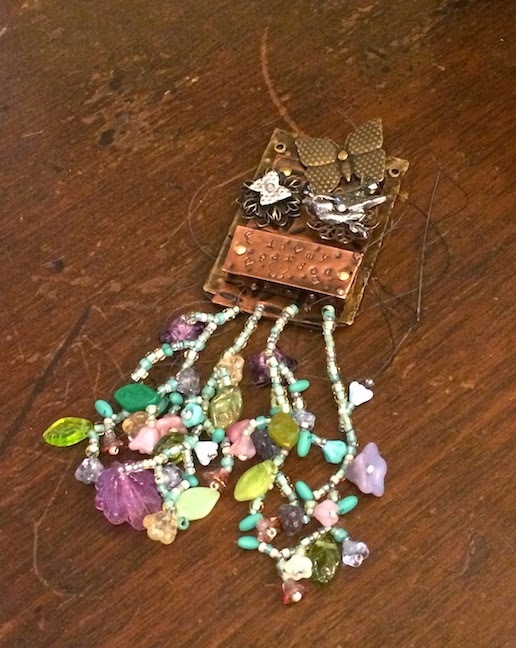 I used eyelash ribbon in my design and it gave the piece an extra dimension and texture. From the bracelet, I hung one of my new White Copper Octopus/Kraken Pendants. 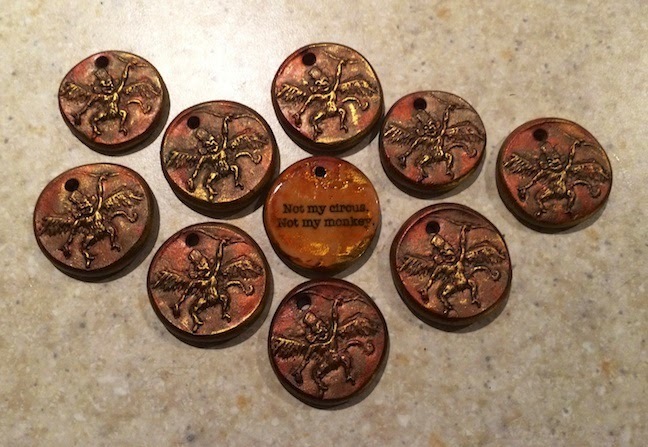 I used Gilder's Paste and Vintaj patinas to add some color to the recesses of the pendant. I'm quite pleased. 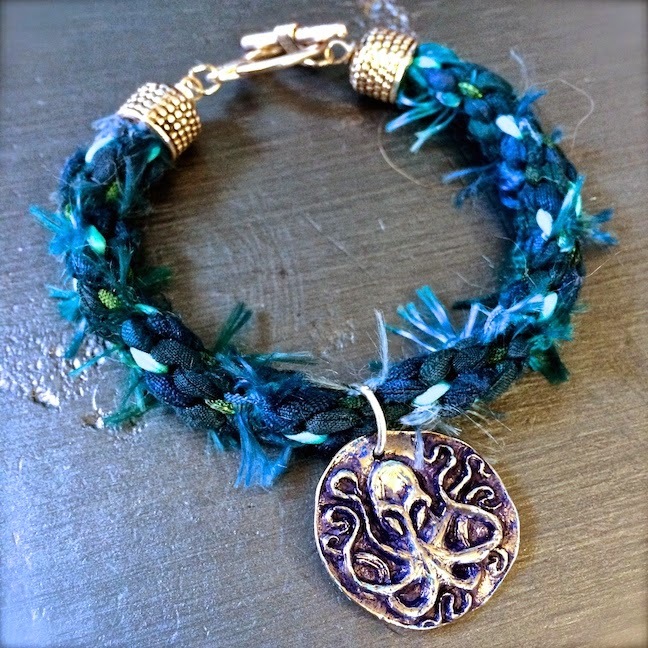 I think the bracelet is fun and definitely has an ocean vibe. PLUS, I also finally learned how to kumihimo! Moon child, am I. Follower of the midnight lantern, with wide-eyed insomnia, I stare at the silver in the trees. Restless tossing gives way to quiet creativity – a lunar frenzy. It has been awhile since I last did a Thursday Giveaway. I thought that I would start things off with one of my favorite new products! This week, one lucky winner will take home a prize package featuring the BRAND NEW Swarovski Crystal Skulls! The prize includes two 13mm Silver Night 2X Crystal Skull beads and one 19mm Jet Crystal Skull Bead. They come courtesy of Fusion Beads and have a retail value over $40! CLICK HERE to check out all of their Swarovski Crystal Skull Beads. 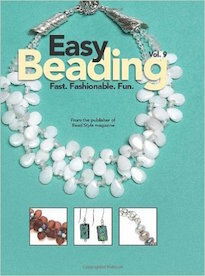 To enter to win this lovely prize of sparkly skull beads is easy! All you have to do is comment on this blog post. One lucky winner will be randomly selected from the comment section of this blog post on Monday, (April 21st) at midnight EST. Make sure to leave your name and email address if it doesn't already appear next to your comment for easy verification. This giveaway is open to all participants, including international readers! Bonus Points: You can earn extra chances of winning these awesome beads by blogging, pinning on Pinterest, sharing on Facebook, and/or tweeting on Twitter about this Thursday Giveaway. Don't forget to add each of your acts of social media kindness as a separate comment for your additional entries to win! 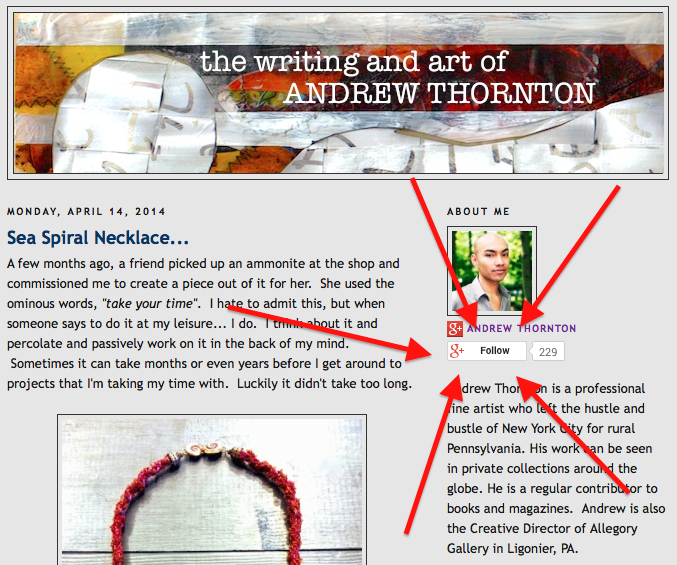 Extra Bonus Points: If you're not already a follower of this blog, you can get an extra entry by following it! It's easy. Just find the button on the right side of the page underneath my photo that says, "Follow". Click the button and follow the instructions. Don't fogey to add an additional comment saying that you have done so for your extra chance to win! When I was little, I used to love the saying that "every cloud has a silver-lining". I would imagine clouds with sparkling interiors, that gleamed like polished chrome. In my mind, the sky was filled with floating Airstream Travel Trailers hiding in plan sight. Later, when I found out that it actually meant that every bad situation had some good, I loved it even more. The older you get and the more life knocks you around, it becomes even more vital to search for the positive. It's important to discover those silver-linings and find the beauty when things might seem less than pretty. Walking through the garden on a spring day, hellebores might not seem that remarkable at first. They are not as showy as irises or have the technicolor brilliance of daffodils. Crocus flowers, one of the earliest to bloom, even have the upper-hand at being some of the first pops of color after the monochrome of winter. In comparison, at first glance, they can seem sort of plain. But if you look closer, hellebores are some of the most gorgeous and varied of flowers. The flowers come in nearly every color, including greens and blacks. If you take a moment to turn up the downward facing flowers, you'll be rewarded with a unique beauty. The petals can be speckled and fan out around a crown of fringy stamen. The flowers almost seem modest, concealing their loveliness. 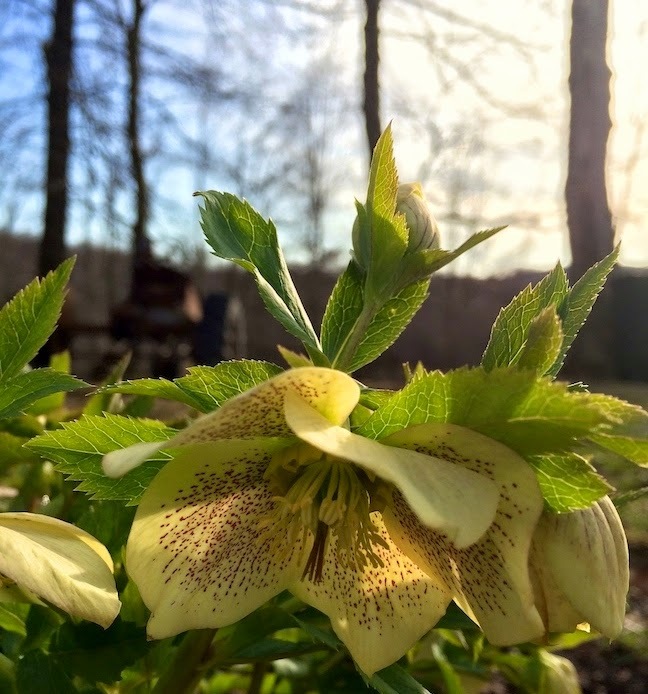 To truly enjoy the hellebores, you've got to change your perspective – you have to be willing to get on the ground or flip the flower up. Whether it's above the clouds or under every petal, there's an important life lesson: There is good in everything, even the most troubling of times, but it'll remain hidden until you seek it out. A few weeks ago, I was on a carving kick and created a flying monkey mold. I was inspired by a Polish proverb, "Not my circus, not my monkey." I really just made it for myself, but when I posted it on Facebook, it seemed like others liked it too. So I made these. Each flying monkey has a different expression. I pressed them out in polymer clay, added the words, baked them, stained the pieces with alcohol inks and buffed them with Gilder's Paste and colored waxes. I probably won't make anymore or put them into production to sell them. I'm going to keep some of them and give the others away as gifts for friends. I think it's important to take some time (even if it's only a little bit) to make something for yourself. It's even more vital when your profession is a creative one. Sometimes artists and makers-of-things get stuck in this rut of making things that they think will sell or what others want them to make. While that's all well and good, we occasionally have to honor our personal muses and take time to play. It's hard to believe that April is halfway finished! 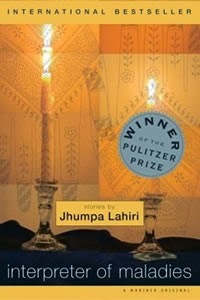 The April selection of the Inspired by Reading Book Club is the Pulitzer Prize-wining collection of short stories, "The Interpreter of Maladies" by Jhumpa Lahiri. 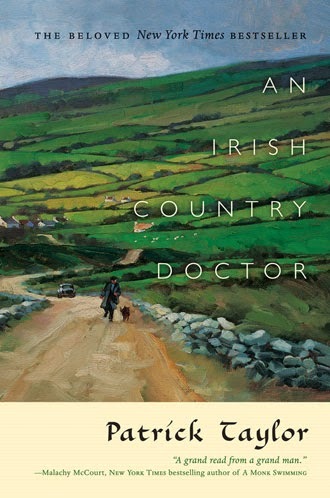 The nice thing about short stories is that it is ideal for participants with busy schedules. While some of the stories are super short, they are all emotionally charged and richly detailed and perfectly suited to inspire unique creations! 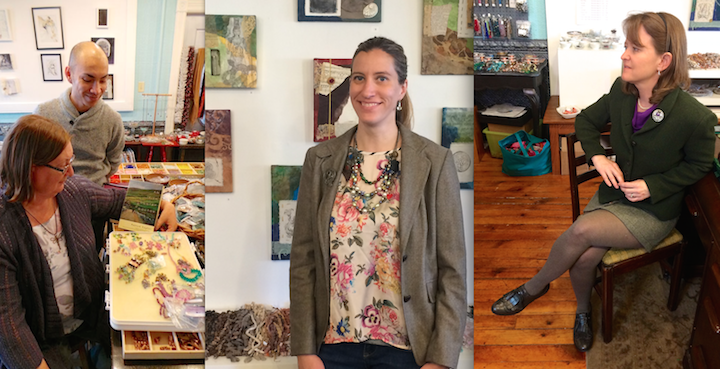 The in-person meet up is scheduled for April 29th from 6PM to 9PM at Allegory Gallery. 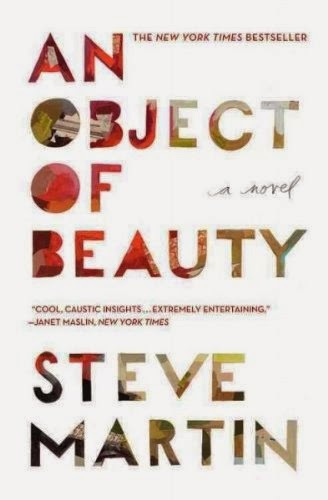 It is the last book club meet-up that we will be having in our current location. So, it'll also be a little bit of a farewell party for space. 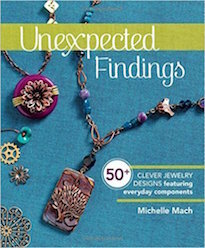 The blog hop reveal is scheduled for Wednesday, April 30th. I hope that you'll be able to participate! I can't wait to see what everyone is going to make and hear about what inspired them! Another piece that I created for the Fusion Beads 30 Day Bead Challenge, but never posted is this pendant I made for Day 23. The prompt was to use Crystal Clay and "sparkle on". I had a round, copper bezel pendant and used two-part epoxy clay to embellish it with vintage Cuba stones and vintage Swarovski crystal chatons and vintage rhinestones. I think it turned out super sparkly and very regal. I added the pendant on simple strand of pearls and African heishi rings. 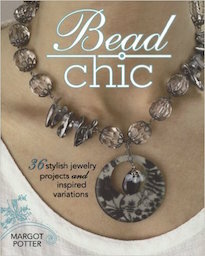 March was National Craft Month and to celebrate, Fusion Beads hosted a 30 Day Challenge. I was going strong up until the last week and things started getting excessively busy with the upcoming store move. The silly thing is that I started on many of the projects and even finished a few of the last challenges, I just never got a chance to post them. For Day 22, we were asked to use more than one metal in a piece. I decided to make this bracelet. 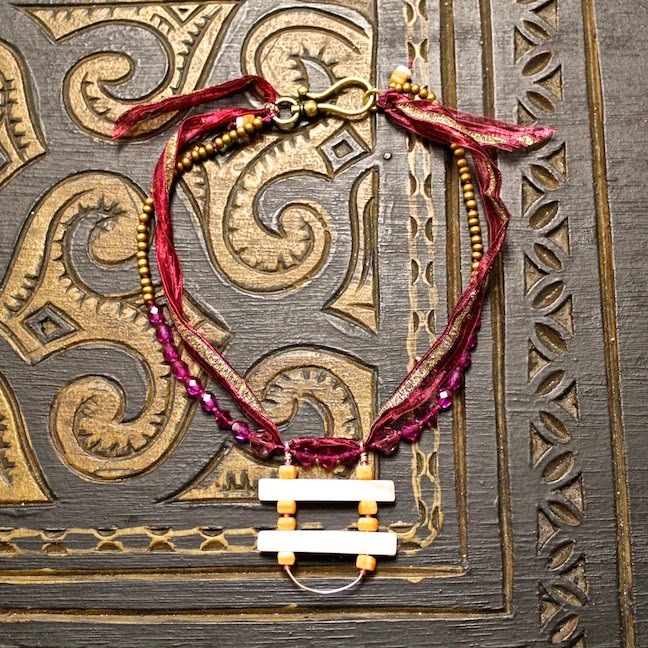 The focal of this bracelet is from Scattered Light. It is a sterling silver leaf. I've been hoarding it for a few years. I paired the leaf slider with a sterling silver toggle from my family at Green Girl Studios, bronze and copper African heishi rings, berry-colored size 2 Japanese seed beads, and copper-colored metal beads with gold-leafing that were taken from a mala bracelet. The bracelet is relatively simple, but I'm smitten with it. I love how all the colors work together and instead of clashing, the mixed metals compliment each other. A few months ago, a friend picked up an ammonite at the shop and commissioned me to create a piece out of it for her. She used the ominous words, "take your time". I hate to admit this, but when someone says to do it at my leisure... I do. I think about it and percolate and passively work on it in the back of my mind. Sometimes it can take months or even years before I get around to projects that I'm taking my time with. Luckily it didn't take too long. For this piece, I enlisted help. William learned how to kumihimo while we were at a trade show in Hawaii and he made the spiraling Japanese knot-braid. 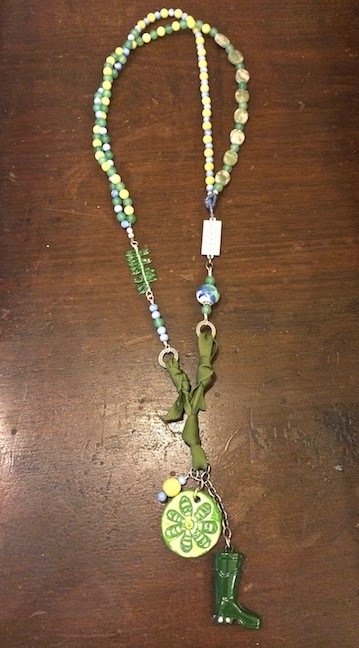 I picked out the recycled sari silk ribbons and pieces of cording and he created the base of this necklace. I like the idea that the cord is a spiral and it furthers the spiral motif. I had made a pair of earrings for this friend earlier in the year and knew she liked reds and earth tones. I decided on a muted wine color and tried to pick up some of the reddish-browns in the ammonite. 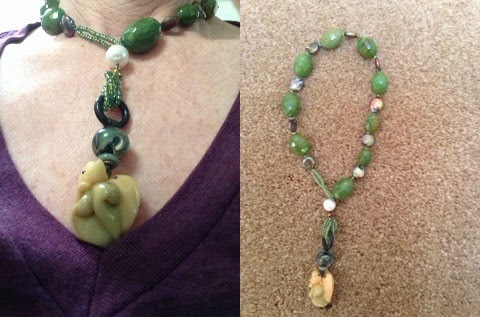 For the clasp, I used a bronze one from my family at Green Girl Studios. They make a really cool seashell clasp. I also incorporated some fun, bronze bead caps for the cord ends. 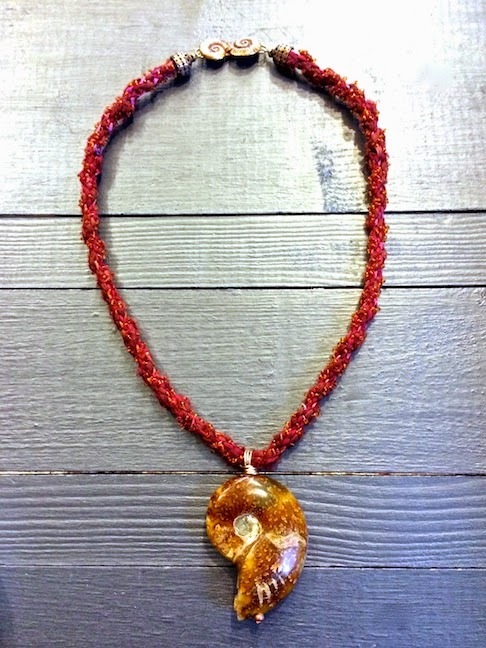 I wanted to pick up the golden topaz hues in the fossilized shell (which I wire-wrapped into a pendant) and integrate it with the clasp, so I sewed on a bunch of Japanese seed beads. It gives the piece more texture and a studded look. I'm pretty happy with the end result. Even better, so is my friend! I'm glad that I could create a piece that could do the ammonite justice! Quick moving storm clouds barrel across the skyline. They move like a stampede of white-hoofed, wild stallions – a threat in the wind, heavy heavens, soon gone. Dark chased by light. Last night we drove up to Indiana, PA and stopped by The Brown Hotel to check out a performance by singer/songwriter, Chris Pureka. The venue reminded me a lot of some of the bars back in Brooklyn. With a cool, neighborhood vibe, the bar had cheap drinks, folksy music and a nice mix of people in the crowd. A local favorite, Melville Walbeck, opened for Chris. I really enjoyed Chris's performance and feel lucky that she came through the area. She was on tour in Europe for several weeks, playing gigs in major cities like London and Paris. Having her come out to our neck of the woods was a real treat! 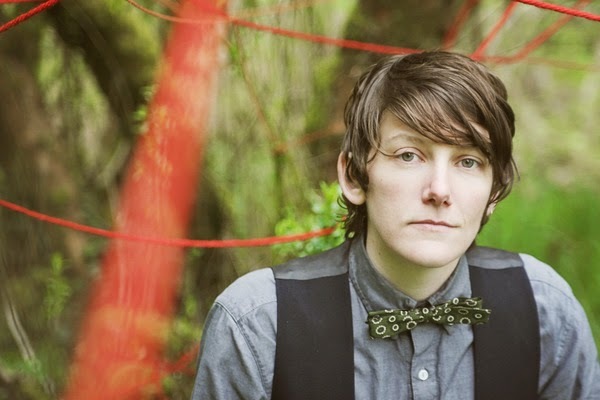 I became aware of Chris's work a few years ago and picked up her album, "How I Learned to See in the Dark". I highly recommend it! I love how honest her music is. There's something genuine about it that feels naked and raw. Her songs have a great depth, and while on the sadder side, there's an unrelenting hopefulness that underlies the heartbreak and quiet observations. My kindergarten teacher kept a construction paper watermelon slice tacked to the wall. The seeds represented the days until summer. Each day, she'd take one down and we'd sing a song we learned throughout the year. I remember thinking, "The seeds will never run out!" It was a bittersweet thought. Part of me wanted to be in school forever, singing songs and drawing pictures, and the other part of me looked forward to visiting my grandparents in Arkansas and seeing my cousins. Time seemed to move so slowly then. These days, when I close my eyes to go to sleep, it's hard to remember the blur of events from the day. Things are a jumble of quickly moving moments and scattered fragments – too many deadlines, emails, and phone conversations. It seems as though I am constantly making plans for things that seem so far away, but then are here and gone. 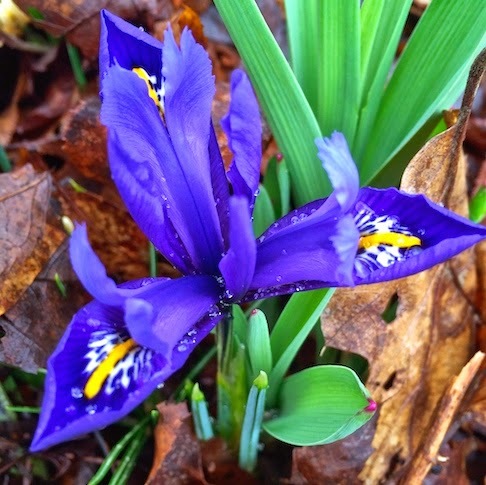 The blooms of spring, so eagerly anticipated, will soon fade and be replaced by other flowers. Much of what I am doing now centers around our moving the store. If it's not actually working on getting all the proper paperwork in order, publicizing the move, or packing boxes, I am picking up freelance jobs to help cushion the transition or feverishly working to ever-promote my work and our goals. Many of the things, I can't even say what they are until they've been published or officially launched. It's exhausting. In my mind, there's a watermelon wedge. The seeds too quickly are slipping through my fingertips. 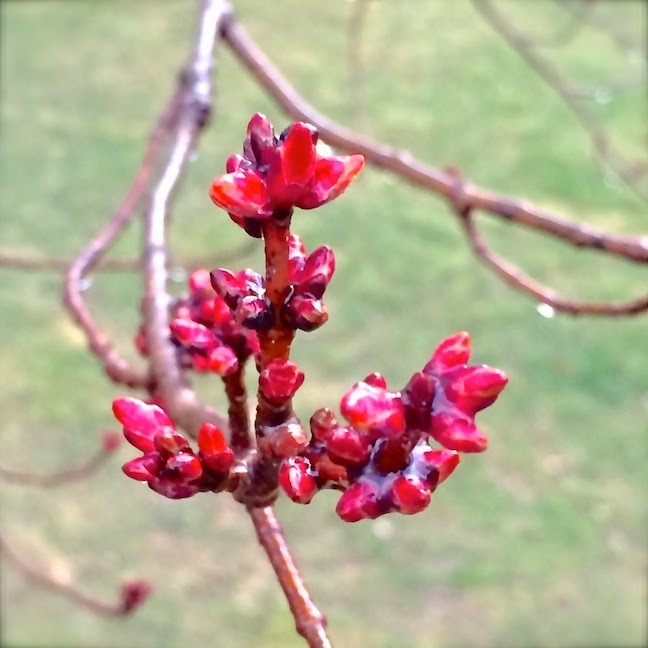 Spring-loaded life, bound in the bud. Branches of leaves, tightly coiled in a promise of what's to come. Red to green and green to gold. A quiet sleep. Set, repeat. Last night we had the good fortune to attend the Cher concert in Pittsburgh. It was part of the Dressed To Kill tour with special guests, Pat Benetar and Neil Giraldo. What an evening! It started off with an electrifying and energetic set by Pat Benetar and her husband and musical collaborator of 34 years, Neil Giradlo. When the curtain dropped, the crowd went wild! Cher was perched on top of a pillar, decked out in glittering beads and a huge headdress plumed with feathers. I was really impressed with the grandeur of everything! The costumes, sets, and backup performers were really exceptional. It had the polish and excitement of a Las Vegas production. Even with all the theatrics, her voice took center stage. Not only did she perform songs from her latest album, but she surveyed her 40 year career, including a tribute to Sonny Bono. What I liked best about the show were the candid moments, when she joked around and told stories. The concert was really fun and I'm happy that we could attend.